Cerastes vipera is a venomous viper species. A short but stocky body the Cerastes vipera is the smallest of its genus. Females are larger than males. Cerastes vipera has a broad, triangular head with small eyes set well forward and situated on the junction of the side and the top of the head. The colour of these snakes ranges from beige brown to a reddish brown with darker brown blotches and lateral markings. Cerastes vipera can successfully be housed in a tubs in a racking system but we prefer to house them in melamine or wooden display cages as it is easier to reach the desired temperature ranges this way. Not being the largest species the size of the enclosure we use is 0.9 x 0.6 x 0.6 (L x W x H) meters (3 x 2 x 2 feet). Being a terrestrial species the height of the enclosure is not essential. On the warm side of the enclosure we have placed a 3 tier cave system which consists of a slate slab placed on top of rocks/bricks providing a hide spot between the sand and first layer of slate. This is repeated another 2 times on top of each other with the rocks/bricks separating the layers of slate. This allows them to move closer to the light to bask at higher temperatures. The slate also retains heat for a long period. Allowing the snakes to “rock bask” during the night if they so wish. Being a desert species the substrates that can be used is kids play sand, river sand, silica sand as well as a variety of reptile branded sands such as exoterra or zoomed. Paper towel or newspaper can be used but is not truly recommended as they then do not have the ability to burrow in to the soil and often stop feeding due to stress. We are currently using kiddies sterilized play sand. We use an average layer of 0.03 meters (0.1 feet), varying up to 0.05 meters (0.16 feet) in some areas to create a dune effect. These depths are used as it still allows the snakes to bury themselves and feel secure but it is not deep enough for them to never be seen. In our experience with the Cerastes vipera being a desert dwelling species they like it rather warm in the day and cool at night. In summer the temperature ranges we use is as follows: A hot basking spot of 40 °C (105 °F) with an ambient running through the enclosure of 32 °C (90 °F) on the cool side, at night we switch off all the heating by using thermos-controllers and the temperatures in the enclosure drop to a range of between 20-24 °C (68-75 °F). The room they are kept in is temperature controlled to ensure it doesn’t get too hot or cold. The method we use for heating is 150w day light bulb which creates the basking spot on one end of the enclosure, allowing the gradient through to the opposite end. With the temperature gradient we provide it allows the snakes to move freely around the enclosure seeking their preferred temperatures and aiding them to thermoregulate their body temperature. With the setup we provide they can move further away or closer to the heat source as well as being able to bury themselves in the sand to cool down. In winter the same methods are used but the temperature changes to a basking spot of 30 °C (86 °F) and ambient running through the enclosure of 24 °C (75 °F) on the cool side and at night the gradient drops to a range of between 15-20 °C (59-68 °F). A shallow plastic water dish is provided on the cool side of the enclosure. This is rarely used by them. Begin a desert species they seem to absorb most of their fluids from their prey items. This being said as stated above a water source is provided and replaced with fresh water on a daily basis. We do not use this method. But a very very light misting can be used to simulate morning dew drops as this would be the main water source in the wild. However this is only recommended once or twice a week in order to prevent high humidity. Being a desert dwelling species we provide little to no humidity. In our experience this species tends to have a slow metabolism so we offer prey items every 14 days (for adults. Every 7 days for younger animals depending on item eaten). The prey items we use is frozen/thawed rat pinkies. They will gladly feed on small rodents and lizards when live prey is offered they do make use of caudal luring. Baby care: Babies can be hard to start on rodents and due to their very small size (0.12 to 0.15 meters (0.4 to 0.5 feet) roughly) they often do not feed on whole pinks. Starting them by assist feeding pinky parts is one of the more commonly used methods. However success has also been had by offering grasshoppers, crickets and small scorpions. In our experience working with this species when bothered they do strike out and have quite an aggressive disposition. They also don’t sit well on a hook and move around when handled. The only time we handle ours is when we move them for cleaning. The enclosure in monitored on a daily basis and spot cleaned when needed. Furthermore the entire enclosure is emptied once a month. This process includes taking everything out and sterilizing with F10, spraying the inside with F10 and wiping it down and left to air out. Before putting the new sand/substrate back in, it is placed in a tray and baked in the oven at 180 °C (355 °F) for 60 minutes to eradicate and remove and unwanted bacteria. 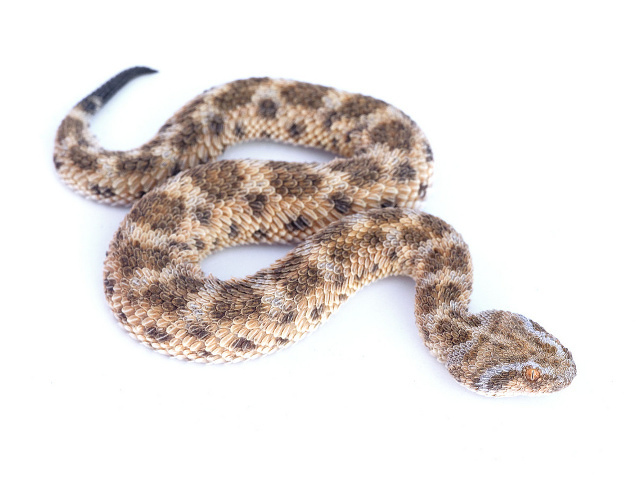 The smaller, younger Cerastes vipera tend to shed more frequently at an average of once every 30 days. The adults and larger specimens appear to shed only once every 90 days or so. With the care and husbandry we keep our individuals with, we have had no issues regarding bad or stuck shedding. Cerastes vipera are a rather hardy species of snake as long as all the basic care is kept up to standard. However they do have the potential of ailments or illness. Most common issue with these snakes would be starvation, most commonly associated with lower temperature and or not providing decent hiding/burrowing space. If kept too cold or stressed, these animals tend to refuse food! They are also prone to skin ailments like “scale rot” due to damp substrate. Keep them dry! High humidity is also often the cause of “RI” (respiratory infections) so make sure the humidity is kept in check. Due to the slower metabolism they are also prone to obesity and feeding should be monitored to ensure overall good body condition.